Eris is the Greek goddess of chaos, strife and discord. She was certainly having a good time in Vathi, Ithaka the day we arrived. It was one of those days….. We couldn’t get an internet signal in Petalas so decided to wing it and leave without one, having being driven off by the mosquitoes. Our thinking was that the typical wind blows in or out of the Gulf of Patras so we would have a beam reach for our journey south to Killini. Once out from behind the islands we hoped to get internet and check on the weather. Unfortunately no immediate internet signal came to be so we carried on south. A F5 picked up as we passed Nisos Oxias which we put down to katabatics off the jaggedy island. Once past we’ll have that lovely beam reach we continued to tell ourselves. Well no. The wind went southerly, we were plugging into a small chop and my sealegs had wandered off after months of calm, short journies. We finally got internet which confirmed the southerlies for the rest of the day. We had no great burning desire to spend 4 hours plugging into the wind to get to Killini so did a nifty right turn and headed for Cephalonia instead. With a much easier motion we settled in for a gentle motor. An hour or so later we heard rumbles from the sky and saw, looming ahead, a great, grey, rumbling swarm of cloud swallowing Cephalonia. We were heading right for it. Another right turn and off we were heading north for Ithaka instead, trying to outrun the storm. We succeeded with just a few spits and spots of rain which were very welcome after weeks of blistering heat. 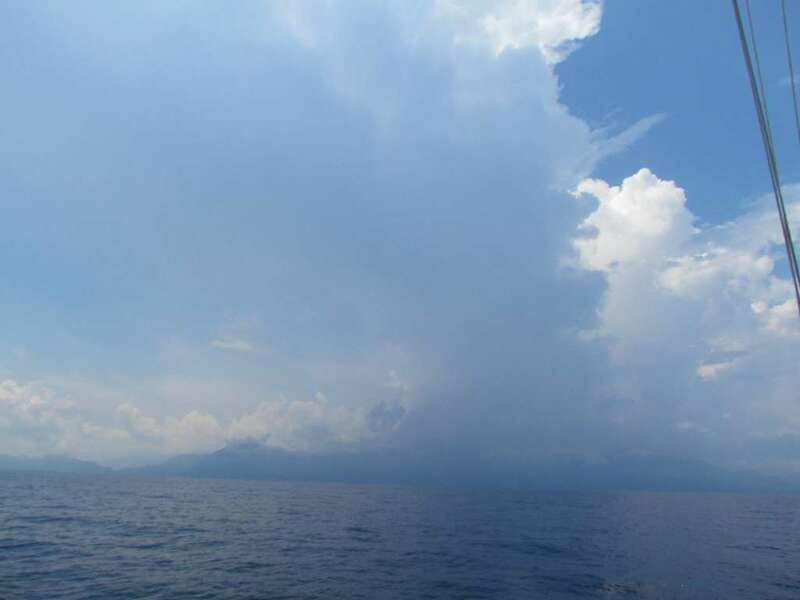 Meanwhile the thunder and lightning rolled on up Cephalonia. Into Vathi and there was only one other boat in the area we’d chosen to anchor in and we picked a spot alongside them. With Wandering Dragon there was just 3 of us. We’d motored for 7 hours, covering 34nm, to end up 20nm directly across from our starting point. Oh well, one of those days. As we settled down with a relaxing vino another storm rumbled to the south. Then the wind picked up and the vino was cancelled. 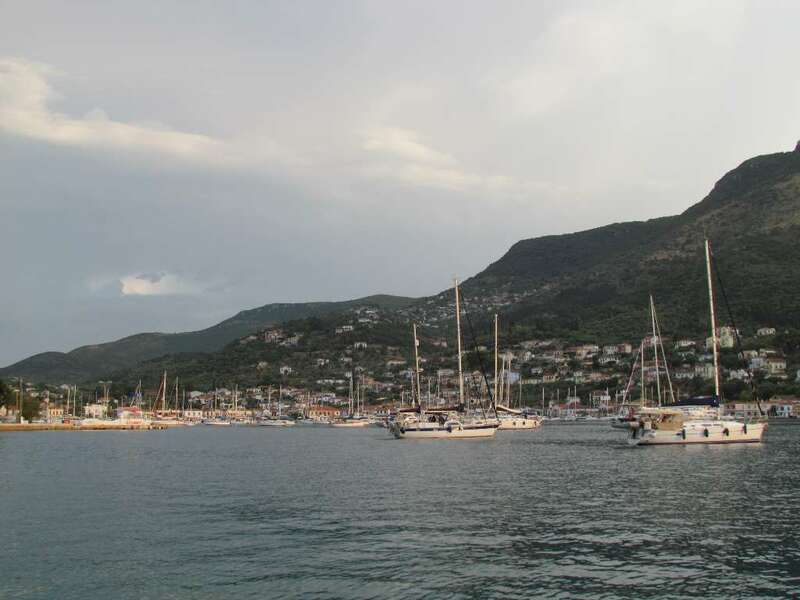 Soon after it seemed most of the boats in the southern Ionian decided to come in to Vathi. The wind was now blowing from the south; when we arrived it was north westerly so we’d set to that direction and reversed into the shallower water along the shore. Now we’d swung away from the shore and boats were anchoring in front of us, if the wind went back north they’d be in very shallow water. All around us boats were racing each other for space, coming in from different directions at full pelt to drop the anchor and keep on going over the top of it. In the gusting wind boats were swinging around at every angle, sailing around the chain and making it difficult to judge where anchors lay. We have never been in a situation like that where so many boats arrived en masse. Plenty of shouting went on and for the first time in a long time we deployed fenders in an anchorage. In the space of half an hour over 100 boats came into Vathi port. All evening and into the night superyachts, small yachts and powerboats crewed by charterers and owners; they all arrived in a steady stream to Vathi, some came in wearing full oilies so the weather must have been very exciting out there. The port police had to move boats on from the ferry area and eventually declared the south part of the bay full. Right up until midnight they were still coming – on the radio we heard a flotilla of 6 boats discussing where to go. Then we went to bed and I foolishly uttered the words “I can relax now and go to sleep, no one is going to try and squeeze in here”. Less than 10 minutes later we heard an engine and where did the new arrival go – yep, right next to us! Oh, and those boats that anchored close in shore? During the night we had a small blow from the north. Cue the sound of chain being rapidly pulled in as those boats realised they were in very shallow water. We reckoned there were over 200 boats in that night, the start of the main holiday season combining with bad weather that sent everyone running for cover from the surrounding anchorages. We were glad we got in when we did. We’ve since heard of sad tales of Maydays, yachts on rocks and yachts dragging onto others and causing damage. We got off lucky that night – the storms rolled around us and all we knew of them were flashes of distant light and a few rumbles. The next morning an exodus began in the opposite direction and a few days later we’re one of two boats left in this part of the bay.